SCA crew pose for a photo in the Pinetum. 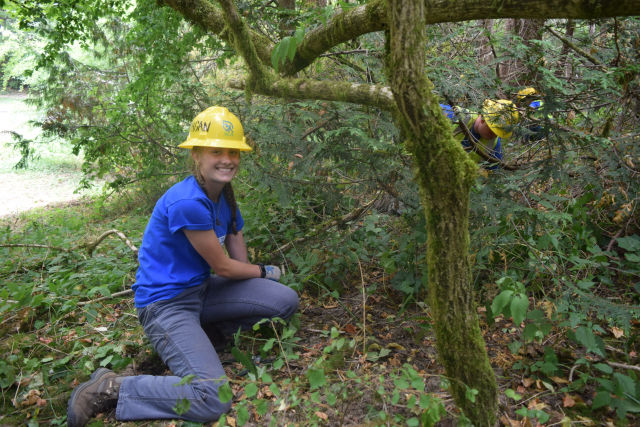 If you’ve driven along Lake Washington Boulevard this week, you may have noticed some young folks hard at work removing blackberry, morning glory, and other invasive weeds from the banks of Arboretum Creek. They are high-school students recruited by the Student Conservation Association (SCA), and they will be here for four weeks this summer helping staff gardeners from the University of Washington Botanic Gardens and Seattle Parks and Recreation restore the creek and surrounding riparian habitat on the west side of the Boulevard. It’s part of a larger, 18-month project that the University, Parks Department, and Arboretum Foundation launched this spring to clean up and enhance the plant collections and natural areas along the Boulevard and Loop Trail corridors. The project is made possible by a generous gift of $275,000 that the Foundation received this spring from a longtime friend of the Arboretum. Students hard at work pulling ivy near Arboretum Creek. 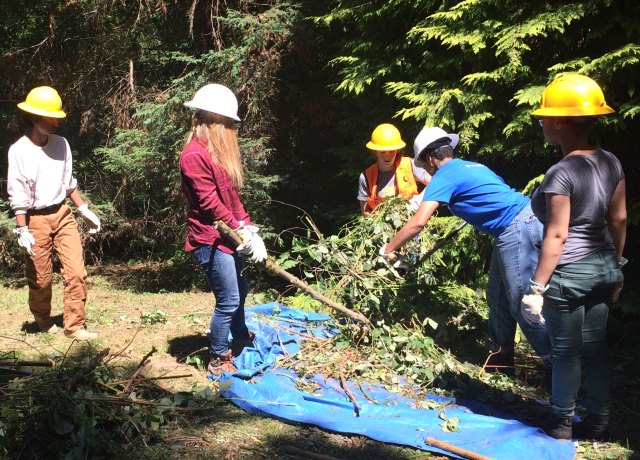 The students are from all over the greater Seattle area, and they’re not just here to work. The creek project is one of eight along the Boulevard and Loop Trail that the Arboretum’s managing partners have planned for 2018 and 2019. It’s also one that Arboretum gardeners have been thinking about for quite some time. 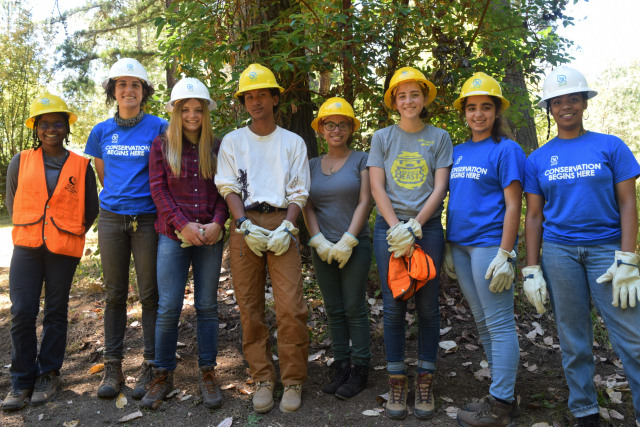 For the most part, the SCA crews (there’ll be a different one here each of the four weeks) will be working on weed removal, such as cutting and removing Himalayan blackberry canes and “grubbing”—digging out—their root crowns and major roots. But David hopes they’ll also be able to do some sheet mulching to prepare some areas for future planting. SCA crew hauling blackberry out of Arboretum Creek in the Pinetum. Other planned projects include removing invasives from along the east side of the Boulevard, from the Gateway to Chile to the south end of Azalea Way, and planting new trees and shrubs that are more in keeping with the Pacific Connections themes of this area. We’ll also be renovating and augmenting the Viburnum Collection along the Boulevard and Loop Trail and planting companion plants for extended seasonal display. To help accomplish all of this, the UW Botanic Gardens is using some of the funds from the gift to hire three new temporary gardeners and purchase an array of new equipment. One of the new gardeners, Derek Allen, a recent graduate of the Masters of Environmental Horticulture program at the UW, will work on the project (at 75 percent time) for the entire 18-month span. 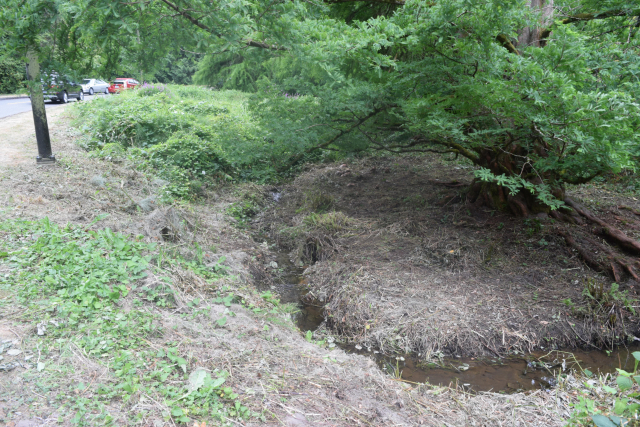 A section of Arboretum Creek with invasives removed. Some of the funds from the gift are being used by Seattle Parks and Recreation to manage noxious weeds and invasives in the newly created wetlands along the Loop Trail north of the Birch Parking Lot.